Version 7 of Firefox browser is now available for download. Once you install this new version, first noticeable thing will be loading speed. Now Firefox opens much faster and render webpages quickly. Next thing that might catch your eye is the URL address bar not showing full URL. 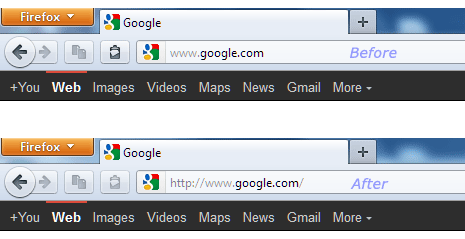 By default, http or https is now not displayed or hidden in the address bar of Firefox 7 browser. It is important to know if you are using normal http version or more secured https version of specific website like Google, Facebook and so on. To view http or https as a part of full website URL in Firefox 7, you need to modify following setting. 1. Open Firefox 7 web browser on your computer. Type about:config and press the Enter key. 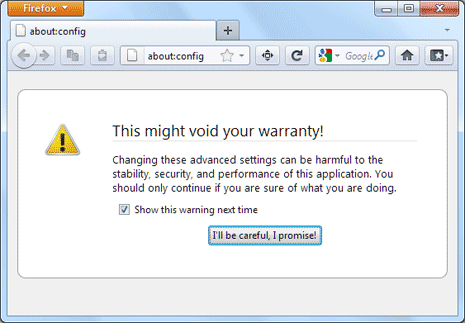 Then you will get prompt screen, here click “I’ll be careful, I promise!” button to continue. 2. Then in the search box next to Filter at the top type browser.urlbar.trimURLs and press then Enter key. Double click on displayed listing to set it to False. In False state, complete website URL including http or https is displayed in Firefox address bar. In ture state the http or https part of website URL is hidden. Showing http for sure helps in quickly knowing if you are using normal http or more secure and encrypted https version of a website.